Written by Melissa Gaskill. Photographs by Will van Overbeek. 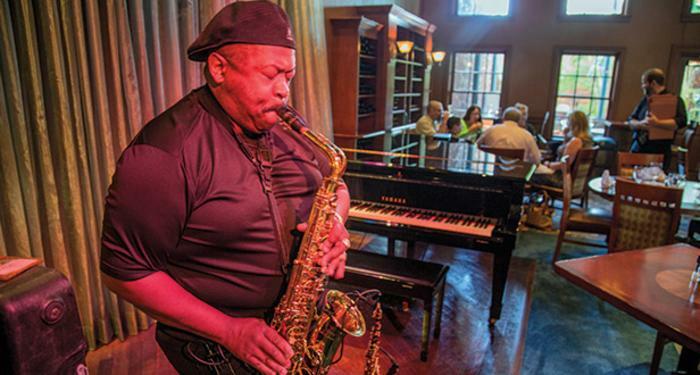 Some might call Suga’s Deep South Cuisine and Jazz Bar in Beaumont an accidental restaurant. Owner Hervy Hiner Jr. and his partner Rosalind Hall-Hiner share a lifelong love of food, but neither set out to make a career of it. Rosalind, a native of Beaumont, holds a master’s degree in social work and serves at a local hospice. She grew up cooking with her mother and grandmother and was the outstanding homemaking student in her senior class. Hervy grew up in Pittsburgh and attended Baylor College of Medicine, graduating with a specialty in nephrology. “My father was a vocational education teacher and my mother a home economics teacher, and we raised cows, so I was surrounded by food growing up,” he says. After moving to the Beaumont area to practice, Hervy visited New Orleans and became fascinated by Cajun and Creole cuisine. As he attended medical meetings around the country, he tasted various styles of Southern cooking popular in South Carolina, Virginia, Florida, Georgia, and Texas. “When I look at Southern food, it isn’t one simple type of food, but a varied and eclectic palette of flavors,” he now says. In 2000, realizing how enthused her partner had become with the complexity and variety of Southern cuisine, Rosalind proposed the idea of opening a restaurant, but it took Hervy a while to warm to the idea. Eventually, when the perfect building went up for sale, he realized that opening a restaurant might allow him to combine his passions for food, art, and contemporary jazz. Suga’s opened in 2005 in downtown Beaumont’s spacious 1914 Coale Building, which is listed in the National Register of Historic Places and once served as a barbershop, a brothel, and a dance hall for teens. Artwork from Hervy’s personal collection, mostly colorful paintings depicting musicians and other performers, hangs throughout the restaurant and contributes to the celebratory ambiance. For Suga’s is a live-music venue, too: A stage in the dining room showcases live music—mostly contemporary jazz—on Friday and Saturday evenings and at Sunday brunch, when the kitchen rolls out specialties like Southern pecan waffles, lobster frittatas, soft-shell crab Benedict, and shrimp and grits. Who doesn’t like some fun after a day of work? I arrive on a Saturday evening with a couple of friends. When we walk in, the hum of happy conversation and live saxophone music greets us. The host leads us to one of the restaurant’s two booths, a large comfy affair facing the spacious, elegant dining room. Rosalind reports that people fight over this prime seating and vows that if she ever builds another restaurant, it will have more booths. I study the menu’s offerings of appetizers, salads, and main courses, which include an extensive seafood selection and three steak choices. It isn’t easy narrowing it down, but I finally decide on the pork chops, which are grilled and roasted with a tart cherry sauce, and served with fluffy crawfish-and-sausage cornbread dressing and a side of braised greens. I take a bite of this followed by a bite of that, and then another until I can’t believe I’ve eaten it all. Somehow, I also manage to try what my dinner companions ordered; the sweet tea-brined fried chicken with garlic mashed potatoes dethrones that of my dear departed Mamma as the best I’ve ever tasted, and the fire-grilled bison tenderloin and sweet potato hash puts a smile on my over-fed face. As Suga’s is also known for its desserts, including three rotating flavors of homemade ice cream, I can’t stop yet. Fortunately, my friends are game. We share a rum-sauce-soaked bread pudding and a slice of New Orleans-style bourbon pecan chocolate pie, and I am not one bit sorry. I would say the translation works beautifully.